Turkey presents numerous different festivals and events across the year, each and every year, from the arts and music, to sport and recreation, and theyâ€™re held all over the country. With so many to choose from where will you go? Well, here are five very different festivals to try to give you a taste of Turkey! You've heard of oil wrestling, so now we'll tell you all about camel wrestling! Admittedly the camels don't usually get to the same level of wrestling as oil slicked men do, but camel wrestling is more for the entertainment than anything else, and makes for a fun way to spend a few hours with the family. Camel wrestling isn't quite as widespread across Turkey as it used to be, and is now confined mainly to the Aegean region of the country, along the west and south west coast. 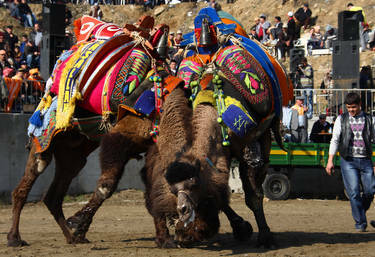 Each January close by to Ephesus, one of Turkey's most famous archaeological attractions, a camel wrestling festival takes place. Basically a couple of male camels, known as bulls, have the chance to fight over a lovely female camel, known as a cow. Often they don't really fight, but when they chase each other around and head towards the spectators it can be quite amusing! If you're visiting Istanbul in May (which by the way is a lovely time to go! ), you should definitely take advantage of the Open Door Architecture Festival that takes place every year. Istanbul is full of the most fabulous architecture, but much of it is usually behind closed doors and inaccessible to the public. During the open door festival however, some of those usually closed doors are opened and you can get to see inside architecturally and historically important buildings. Open door buildings usually include the Ortakoy Mosque which is set right on the Bosphorus and was built between 1854 and 1856. This mosque is a great example of Ottoman architecture. The Istanbul Music Festival is one of the city's longest running festivals and the most popular, with visitors from around the world. It celebrates its 43rd year in 2016 and features plenty of classical music as well as opera, ballet and traditional Turkish music. The festival takes place within a number of venues across the city, and often coincides with other theatrical and music events, so there's usually more than one thing going on at a time. In fact the other cultural festivals in Istanbul span most of the summer, so even if you visit in July you'll still be able to experience an event. The three day Kas Lycia Festival is held in the town of Kas in the south of Turkey, on the Mediterranean coast. Kas is a popular tourist destination throughout the summer anyway, but this festival towards the beginning of the busy summer season is a must visit for families interested in seeing more of Turkey's culture and heritage. You can see local and international folk dances in addition to opera performance, ballet and art exhibitions around the town, and combine this with days on the beach, at the water park, or shopping for souvenirs. You may find this hard to believe but oil wrestling is actually one of the national sports of Turkey! Every year, numerous oil wrestling competitions take place all over the country and each one is very popular, attracting hundreds of competitors and thousands of spectators, but the most famous and revered one takes place in the city of Edirne, right in the far west of Turkey on the border with Greece. This particular tournament is called the Kirkpinar and it's steeped in history having been held here since the year 1346! Oil wrestling is a knock-out tournament whereby men dress in short black leather pants and douse themselves in olive oil. They then wrestle, aiming to get their opponent onto the ground and held in position. As well as the wrestling, which is quite a sight, other festivities occur such as music, dancing and fabulous food, so this festival really is a great introduction to Turkish culture! Plan ahead and sign up for the most popular Turkey tours.